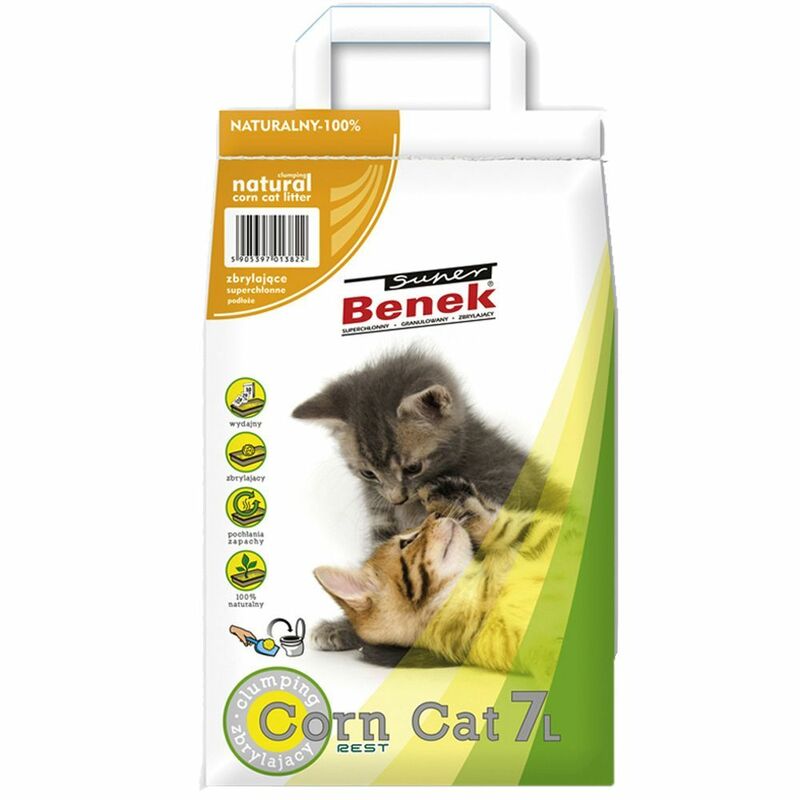 Super Benek Corn Cat Natural is an innovative new litter made of 100% natural plant-based material without chemical additives. Because it is made from pure organic materials, the litter is compostable and biodegradeable and can also be flushed down the toilet. The litter is highly absorbent, so it picks up liquids quickly and forms compact, flat clumps, which means that you can easily scoop out waste and clean the litter box. Odours are absorbed immediately and efficiently neutralised, whilst its neutral odour means it is easily accepted by cats. The litter's design also means that it is leΒ likely to be spread around outside the litter box. Super Benek Corn Cat Natural litter at a glance: Natural clumping cat litter for cats and small pets Made from 100% natural, plant-based materials: Compostable and biodegradeable Flushable: The clumps break down in water, like toilet paper Very absorbent: Fluids are absorbed straightaway and form compact clumps Efficient odour neutralisation: Unpleasant smells are absorbed by the litter, maintaining a pleasant atmosphere in your home Highly accepted by cats: Cats are leΒ likely to object to this litter's neutral, natural odour Reduced spreading of litter around the tray area, thanks to the litter's specific properties. Price just £14.99! Click here to buy now!